Download a blank fillable Dd Form 2810 - Personnel Recovery Debriefing Statement in PDF format just by clicking the "DOWNLOAD PDF" button. 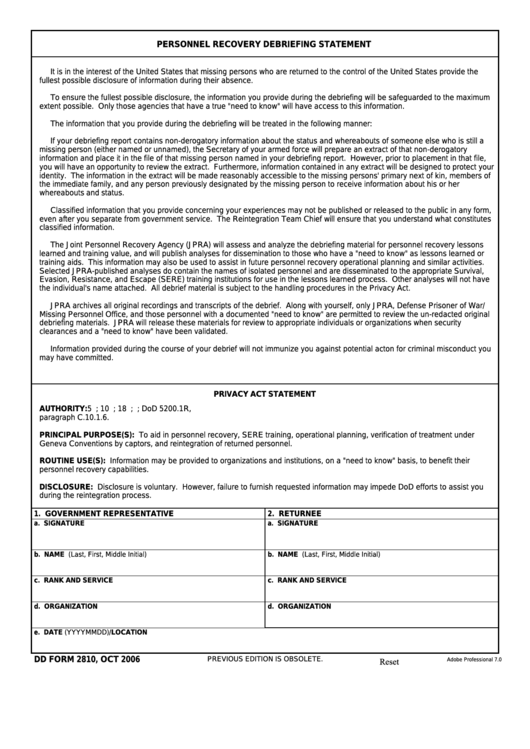 Complete Dd Form 2810 - Personnel Recovery Debriefing Statement with your personal data - all interactive fields are highlighted in places where you should type, access drop-down lists or select multiple-choice options. fullest possible disclosure of information during their absence. extent possible. Only those agencies that have a true "need to know" will have access to this information. training aids. This information may also be used to assist in future personnel recovery operational planning and similar activities. the individual's name attached. All debrief material is subject to the handling procedures in the Privacy Act. clearances and a "need to know" have been validated. Geneva Conventions by captors, and reintegration of returned personnel.